- Well located commercial/industrial unit. - Features air conditioning & roller door access. For further details contact me today. - Well located Commercial/Retail premises, Close to CBD. - Comprises showroom/reception, 2 Offices, Kitchen & Storage. - 173m2 (approx.) floor area. - Close proximity to major retailers including Harvey Norman, Retravision & Bedshed. - Well located commercial/industrial unit. - Comprised of 96m2 of ground floor area & 41m2 of mezzanine (approx.) - Features air conditioning & roller door access. For further details contact me today. - Large format Office/Warehouse of 526m2 (approx.) - Security fenced yard. - Roller door access from side of building. - Available March 2019. For further details contact me today. - Bussell Highway Location. - Area approx. 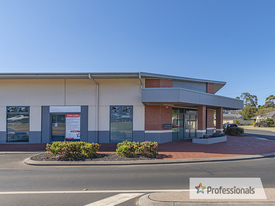 67m2 - Neighbourhood centre with Food Court, IGA, Chemist, Hair Salon & Newsagency. - Close proximity to a number of Holiday Resorts and Caravan Parks. For further details contact Trevor Frusher. - 93m2 Approx. - Includes kitchen & ample storage cupboards. - Reverse cycle air conditioning. - Dual entry points from footpath or arcade. For further details contact Trevor Frusher today.